You have most likely received a post card or seen posts on social media and our website announcing our participation in North Texas Giving Day, our nation’s largest community-wide giving event. By giving on this day, you join thousands of people across the Dallas-Fort Worth Metroplex by investing in our community through charitable giving. Mercy House continues to offer a real, practical solution to the problem of unplanned pregnancy, providing life and hope for the mother as well as the baby. As our residents move from crisis to beautiful, abundant living, we see the cycle of loss broken. The future of two lives are forever changed. You are making a difference in transforming the lives of young women and giving the gift of life to their children. Your gifts are enhanced on North Texas Giving Day! Because of generous corporate sponsorship, every donation of $25 and above given on North Texas Giving Day will be multiplied! Thanks to generous friends of our ministry, the first $10,000 donated to Mercy House will be matched on a 1-1 basis. That means your gift will be doubled! Giving is open only between 6:00 a.m. and midnight on Thursday, September 22, 2016. 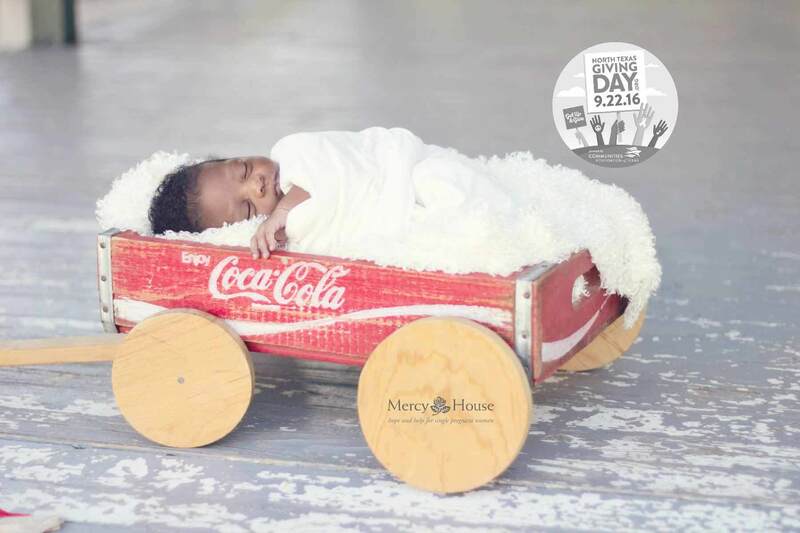 To donate, click on the link: https://northtexasgivingday.org/npo/mercy-house-ministries. Thank you for loving Mercy House!